The American Transportation Research Institute (ATRI) has published the top 100 commercial vehicle bottlenecks in the country. These are roadways which are consistently the most jammed-up across America. The states with the most bottlenecks include California, Texas, Washington, Minnesota, Ohio, Tennessee, Georgia, Pennsylvania, New York, and Connecticut. The group notes "Congestion costs the economy. ATRI research identified trucking industry costs of $49.6 billion as a result of congestion on the nation's highways. That cost generates from 728 million lost hours at industry productivity, the equivalent of 264,500 truck drivers sitting still for an entire year." "Since 2002, the American Transportation Research Institute (ATRI) has collected and processed truck GPS data in support of the Federal Highway Administration's Freight Performance Measures (FPM) initiative. The FPM program develops and monitors a series of key performance measures on the nation's freight transportation system..."
"The information provided through this effort can empower policy and investment decision- making in the private and public sectors by providing stakeholders with a better understanding of the severity of congestion and mobility constraints on the U.S. highway transportation system. This is critical as the nation weighs the resources needed to maintain the country's freight transportation network." OUTCOMES: In 2012, the State of Illinois commenced work on the reconstruction of the Chicago Circle Interchange based on its ATRI ranking as the nation's #1 bottleneck. The $500 million project is expected to be completed by 2019." Here are the top 30 bottlenecks. 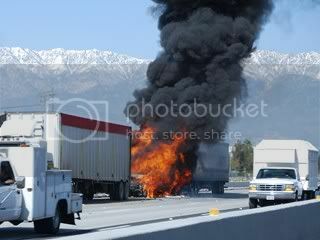 Note that #26 on the list, I-10 at I-15 (they list it as 'San Bernardino, CA' but it's actually Ontario Calif.) That is exactly where this horrible accident occutred, which I wrote about in 2012: You can also see all my trucking-related archives below. You can see the rest of ATRI's '2017 Top 100 Truck Bottleneck List' here. The page includes an interactive map where you can click on each bottleneck to see all the stats and a map of each area. You can download their quick-reference color brochure here. You can visit my trucking website at DontWakeMeUp.org and the new LibertyFight.com Trucking Archives here. .
VILE, DISGUSTING COMPANY: VP of largest fuel chain Pilot/FlyingJ boasts of cheating loyal customers: "F--k 'em early and F--k 'em often" 6/22/13. They cheated their loyal customers out of millions of dollars, and then were raided by the feds, who had recorded their meetings in a sting operation. Many of these companies sued them. This is an older story but very important to remember. This is why I avoid Pilot/FlyingJ when possible. U.S. Department of Transportation Drowsy Driving Quiz Important Info here. Insane Video of 193 Vehicle Chain-Reaction Crash on Interstate 94 in Michigan 1/10/15 [Note: The big RIG drivers in this crash were later cited, and rightly so. Only a reckless and insane maniac would drive that fast in the snow, ice and fog where there is zero visibility. Note: This is the perfect example why we shouldn't have clueless people who don't know the first thing about trucking running the DOT. FLORIDA GOVT IN A FRENZY OVER BEING EXPOSED Florida state government agencies and law enforcement have been visiting my website every day for multiple hours since our expose on the Florida Highway patrol's illegal actions. They are also conducting internet searches to try and cover their @$$ legally.